Some headlines need no elaboration, but here's a go. 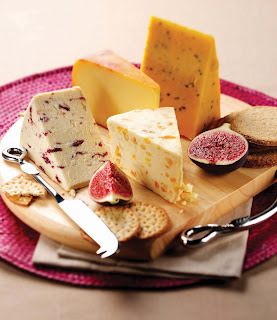 And, yes, we spend a lot of time at The Star talking about cheese. I grew up on a dairy farm; it's a former occupational hazard. Turns out, we’re not alone in our adoration of cured milk products. There are thousands of folks out there, hundreds of whom will converge on Chicago in late July to meet as part of the 25th Annual American Cheese Society Conference and Competition. More than 1,000 cheese makers, retailers and restaurateurs will convene to talk about American specialty cheese. About 1,200 cheeses will be judged during a national competition. While much of the conference is for members only, the public can participate in two cheese events: the Festival of Cheese, at the Chicago Hilton the evening of Saturday, July 26, and a Cheese Sale at Kendall College the morning of Sunday, July 27. Between 2005 and 2007, conference attendance increased by a remarkable 84 percent. The 25th Annual Conference is expected to be the largest in ACS history with more than 1,000 attendees. The conference will be attended by cheese makers from all over North America. Cheese Nirvana can be achieved at the Festival of Cheese, Saturday, July 26 from 5:30 to 9 p.m. Festival-goers will have the opportunity to taste more than 1,200 cheeses. Repeat that, people. More than 1,200 cheeses, including the award winners that will be announced earlier in the day. The cost to the public is $85 per person. The cheese extravaganza continues with a Cheese Sale on Sunday, July 27 from 10 a.m. to 1 p.m. at Kendall College at 900 N. North Branch Street in Chicago, where the public will have the chance to buy specialty cheeses at rock-bottom prices. To purchase tickets for the Festival of Cheese and for a complete list of ACS conference events, times and costs, please call the ACS headquarters at (502) 583-3783.